On my latest visit to the Basque region I visited the legendary Arzak and went on a journey to discover the best pintxo’s of San Sebastian. There were a couple of other places I’d been meaning to re-visit but I decided to go with a wild card on this occasion. 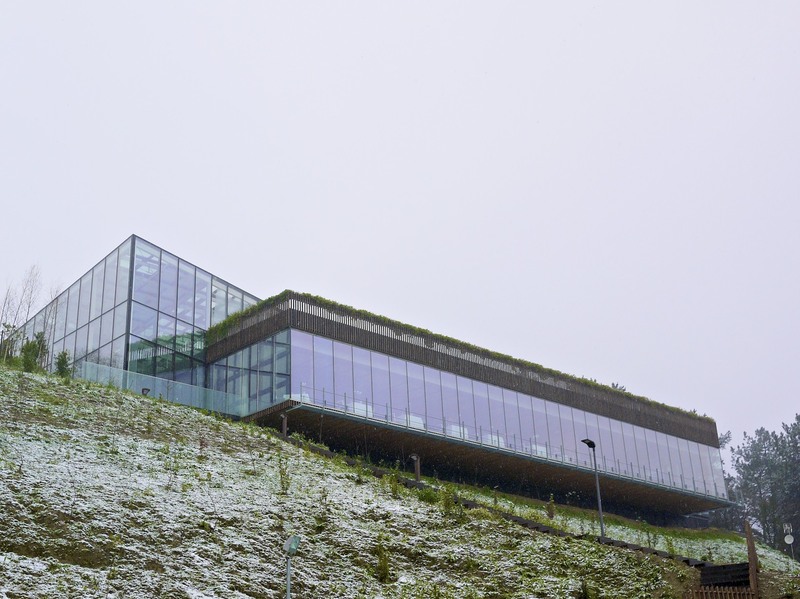 Joining the ranks of culinary excellence in the Basque region in 2012 was Eneko Atxa’s Azurmendi, located only 10 minutes drive away from Bilbao airport. 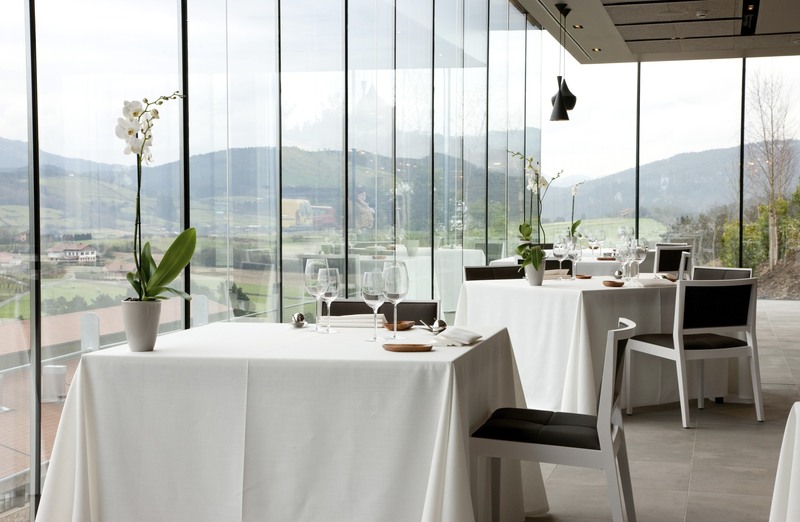 Atxa has impressively amassed three Michelin stars within a very short period of time making it one of the hottest establishments in the region right now. 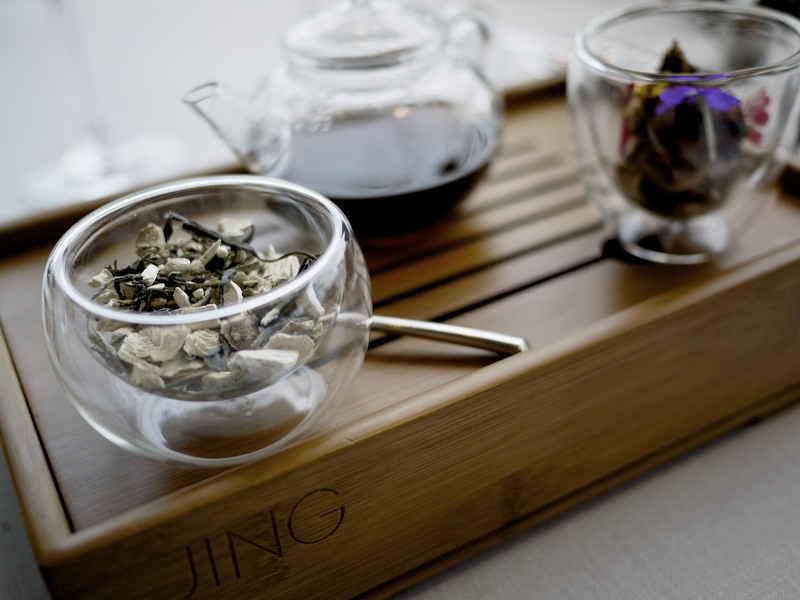 I first heard about this place two years ago when I caught up with Dimi from the Fat Duck and after Michelin’s announcement in 2012, I prodded my partner in culinary crime, Fine Dining Explorer, to come with me on a weekend to see what all the fuss was about. As usual it didn’t take much to convince him. 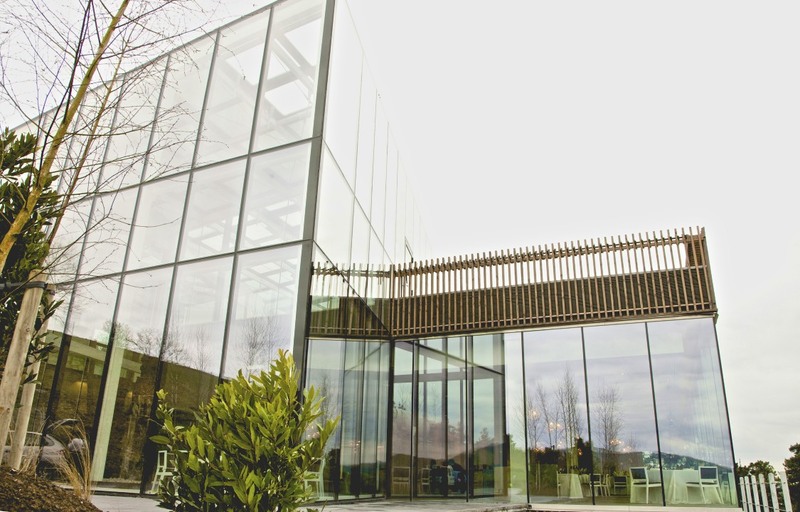 Nestled high up on the hill of the biggest Txakoli winery in the region is a beautifully elongated modern glass cube that is Azurmendi. While it’s a very steep hill to drive up, the view from the top is quite impressive despite the intruding highway that runs parallel to the horizon. At the foot of the hill stands the original winery building that, until the contemporary building was completed in 2012, housed the restaurant. 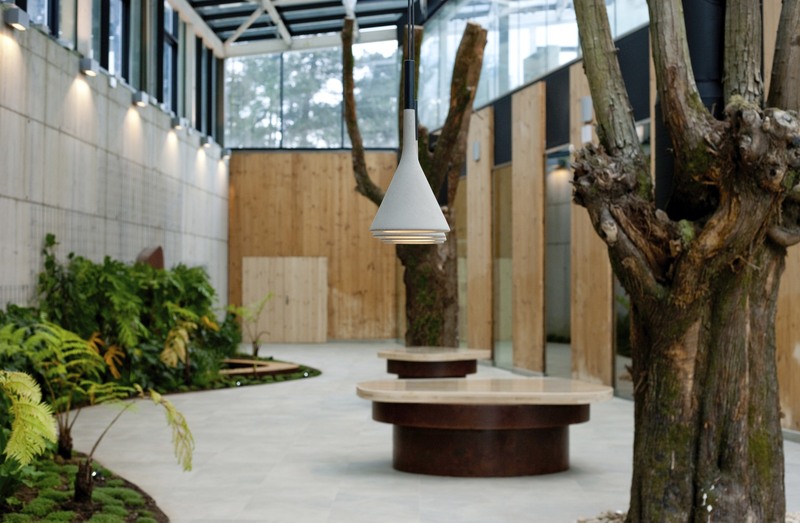 It now is used partly as a wedding venue and a bistro. The weather on this occasion was far more aggressive than the usual rain I am accustomed to in the Basque region – on this occasion it was snowing hard! But this was not going to dampen our spirit. Leaving the blizzard behind, we stepped into the vast contemporary space of the restaurant reception to be greeted by the Maitre D, Jon Eguskiza. He immediately joked that Atxa’s unfortunate absence that day meant that we would be even better looked after as he could spoil us rotten. Whilst I have no comparison to make yet, I can certainly guaranty that Eguskiza did a damn fine job in looking after us that afternoon. He carried on to show us around the building explaining that the green house they integrated into the restaurant was not with the intention of moving towards self-reliance as it was far too small, but rather an opportunity to showcase some of the indigenous vegetables and fresh produces the Basque region had to offer to foreign diners. 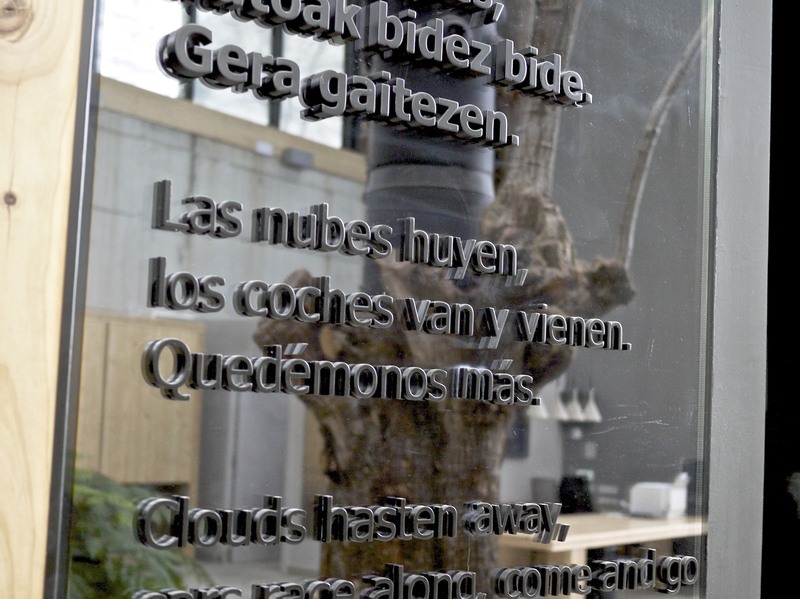 I was particularly impressed with the couple of Haiku’s that had been translated from Euskerra to Castellano and English, all whilst maintaining the rules of haiku. First up was a Peanut made from peanut butter with chocolate and dried mushroom dust coating. This was a bizarre dish as I felt as if I was eating a dollop of slightly sweet butter infused with earthy mushroom flavour. Admittedly this was not my cup of tea. Much better was the Homemade cheese with basil flowers from our garden. The cheese just melted in your mouth and was not too powerful to distract the flavours from subsequent dishes so early in the meal. The last item of the picnic was a Purple onion from Zalla skin infusion, which had been prepared by roasting and boiling the onion. There was an intense onion flavour accompanied by the natural sweetness. 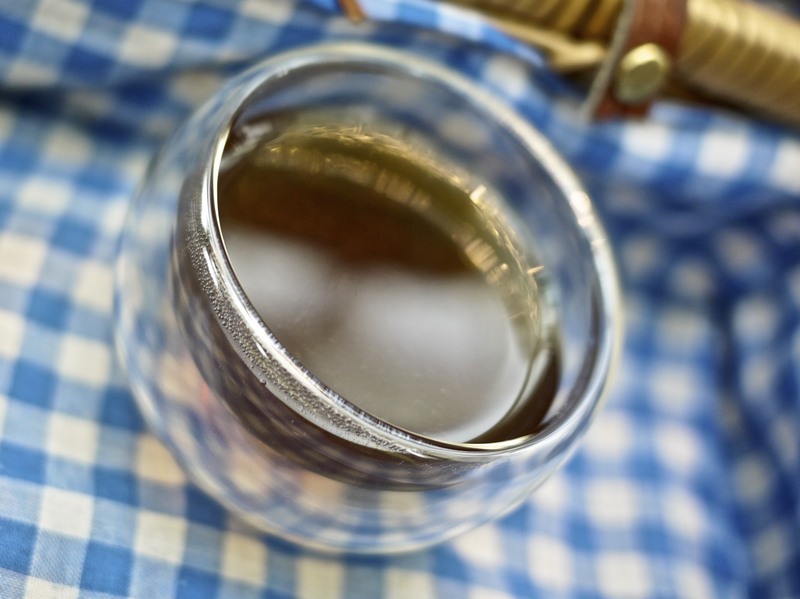 It was rich and clear with a lasting aftertaste. 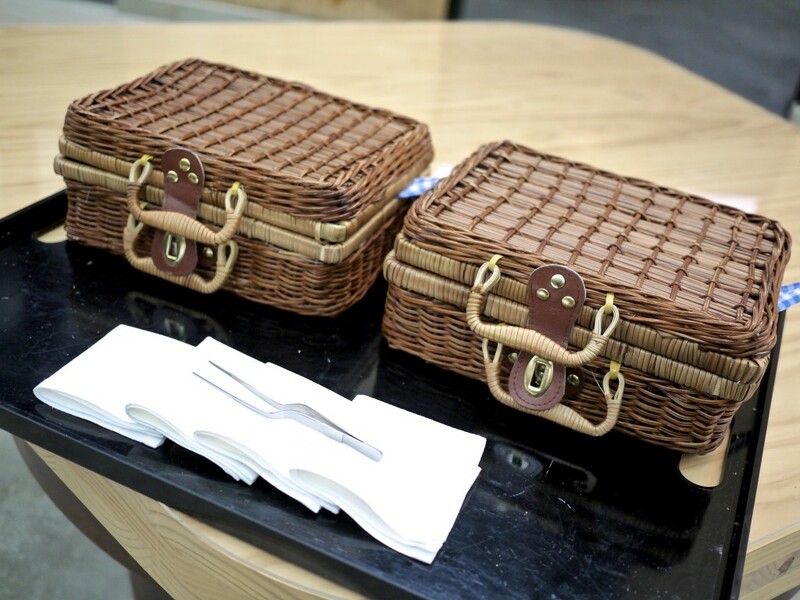 After our picnic we were taken to the vast open kitchen but found only a handful of chef’s preparing the mis-en-place. 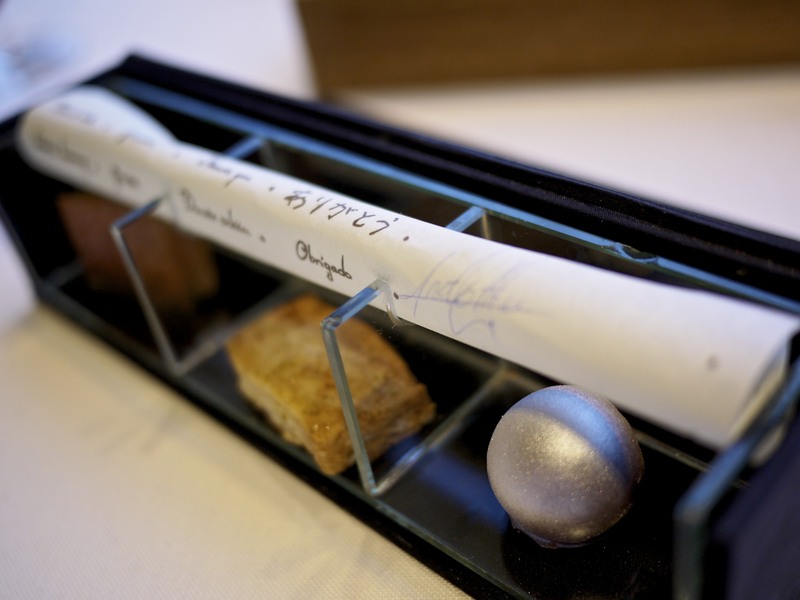 Eguskiza explained that chefs under Atxa were not segregated to one section in the kitchen in order to avoid monotony. Instead, each chef was responsible for multiple courses. This explained why there were far less chefs here than many other three starred restaurants I had been to. We were curious to see whether this would affect the quality of the dishes so we promptly took our seats and left ourselves in the hand of our friendly Maitre D. Tasting Menu? Of course. Matching wine? Absolutely. Brand new dishes? Why not? 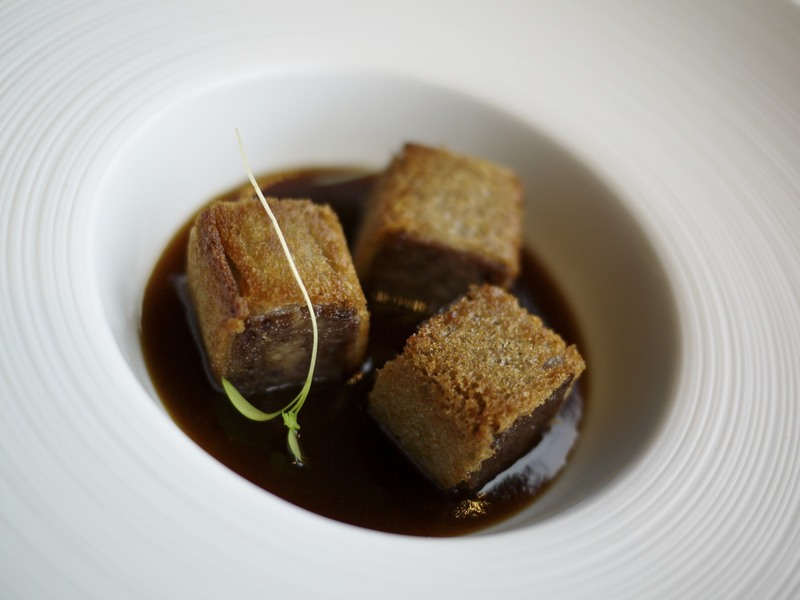 The restaurant offered two menu’s – Erroak (€135) consisting of classic dishes that formed the foundation of Azurmendi’s identity since inception, and Adarrak (€160) which consisted of more dishes and showcased the flavours and roots of Basque cuisine. 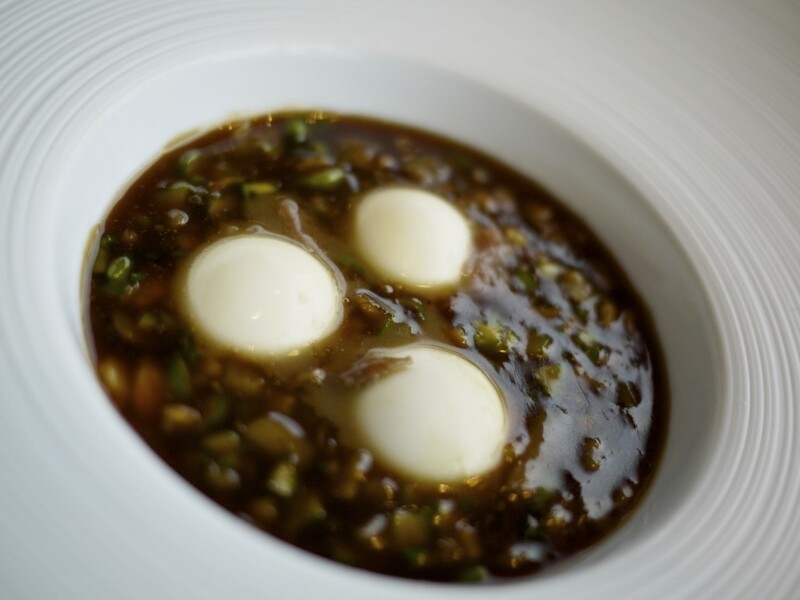 We couldn’t make up our mind so Eguskiza suggested we create a customised menu, using Adarrak as the base, adding some dishes from Erroak to get an overall appreciation and understanding of Atxa’s cooking. Splendid! We ordered a bottle of Cava, Oriol Brut Nature as he ran through some of the options and then we were set. First up on the menu was Egg from our chickens, cooked inside out and truffled. Part of the slightly cooked egg yolk had been taken out carefully with a syringe leaving the outer membrane intact. A rich black truffle infused broth was then injected back in, finished off with move shavings of black truffles from Zaragoza. 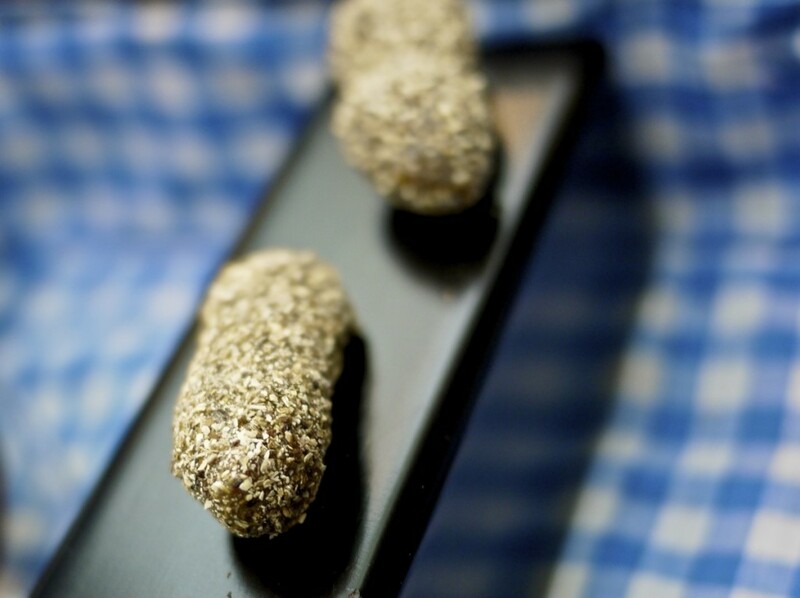 I loved the creaminess of the egg yolk which magnified the earthy flavour of the truffle. A simple looking dish but the attention to detail was amazing, particularly given that the temperature had to be spot on and the membrane was so delicate. What’s more, the dish had to be assembled altogether at the last minute. This certainly made up for the somewhat lack luster amuse-bouche. What a superb start! 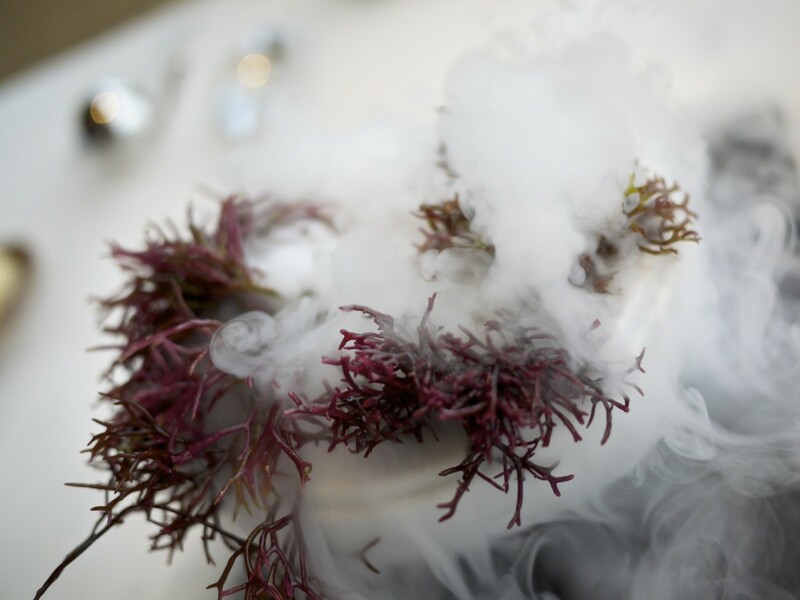 In preparation for the next course a bowl containing seaweed and dry ice was presented and water added allowing the smell of the ocean to wash over us. Almost simultaneously we were served the Oyster, Salicornia, iodinated tremella, sea weed and small crunchy nettles with natural aroma from the sea. 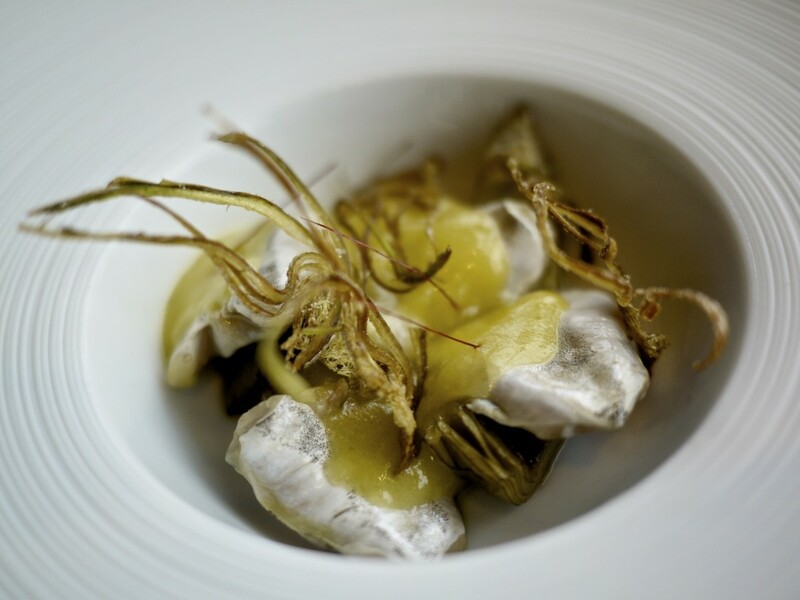 What initially appeared to be seaweed next to the Gillardeau oyster from La Rochelle in the shell was actually gelatinous tremella mushrooms cooked in seawater. 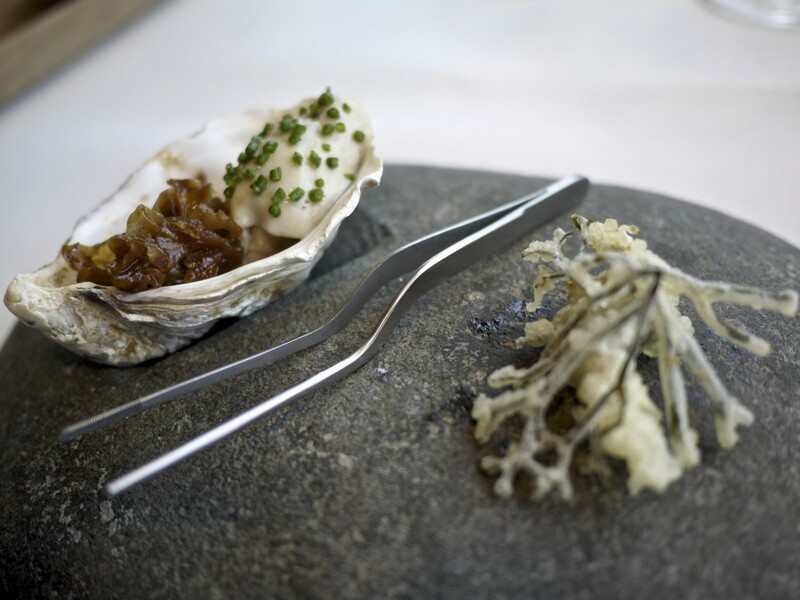 It had a contrasting crunchy texture to the meaty oyster with diced seaweed on top. The accompanying seaweed and anemone tempura had the right level of natural seasoning, executed perfectly with a good crispiness and hardly any oil. 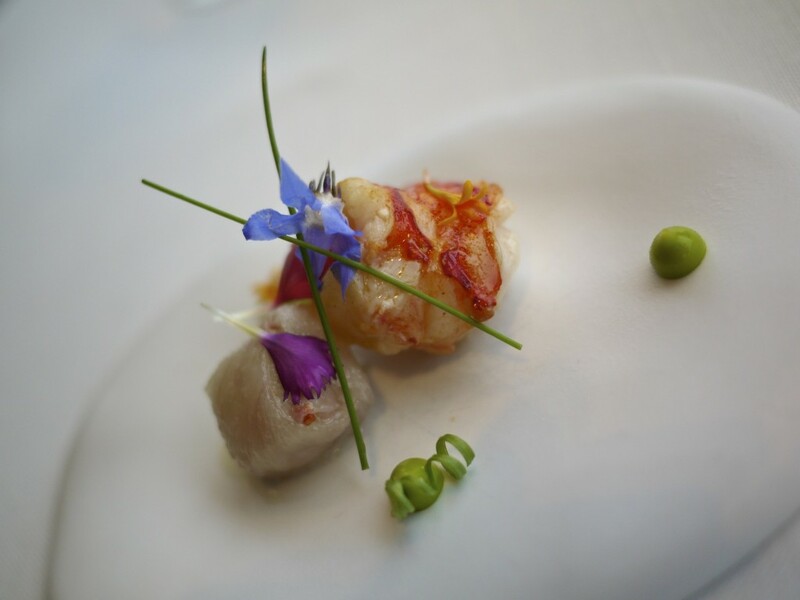 We were then presented with lobster done two ways with the Confited lobster with essential herbs from our garden and pork jowl. On the left was the tartare of lobster that had been infused with oil of essential herbs from their garden, wrapped in a smoky pork jowl. On the right was a beautifully cooked juicy roasted Cantabric lobster. This Cantabric lobster had more of a bite to other lobsters I’ve tried but I personally preferred this texture better. 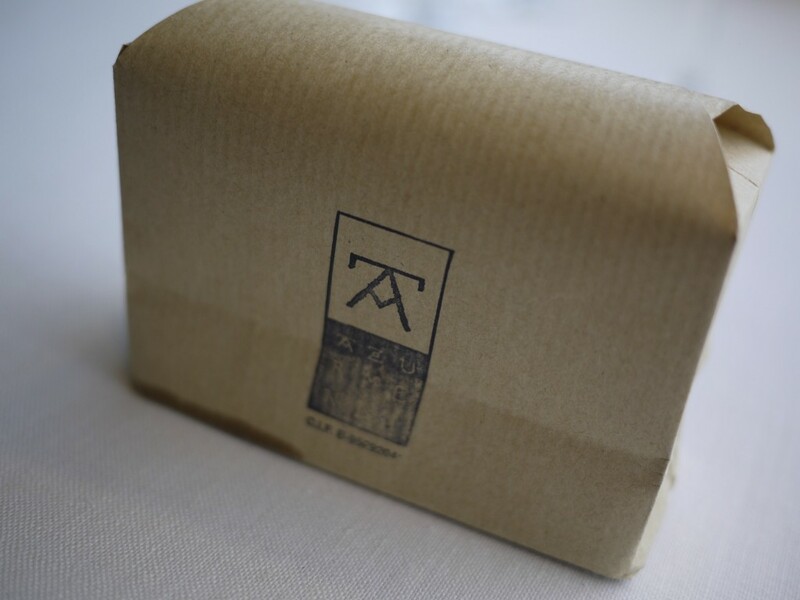 We were initially taken back when the next course was being served as we thought our tasting menu was coming to an abrupt end. Luckily Eguskiza smiled and assured us we were only getting started as he prepared The “Earth” Tea service. 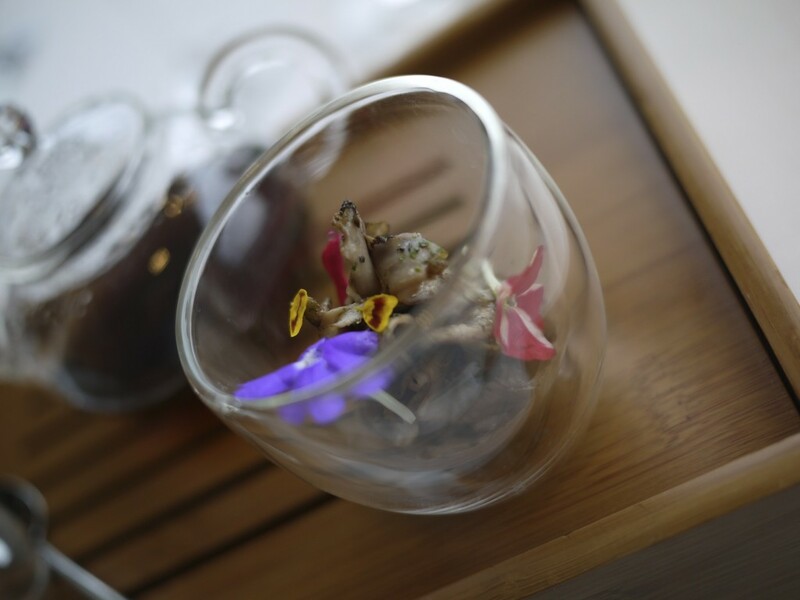 On the right we had a cup containing champignon mushroom with wild edible flowers. On the left were some dried champignon mushrooms. 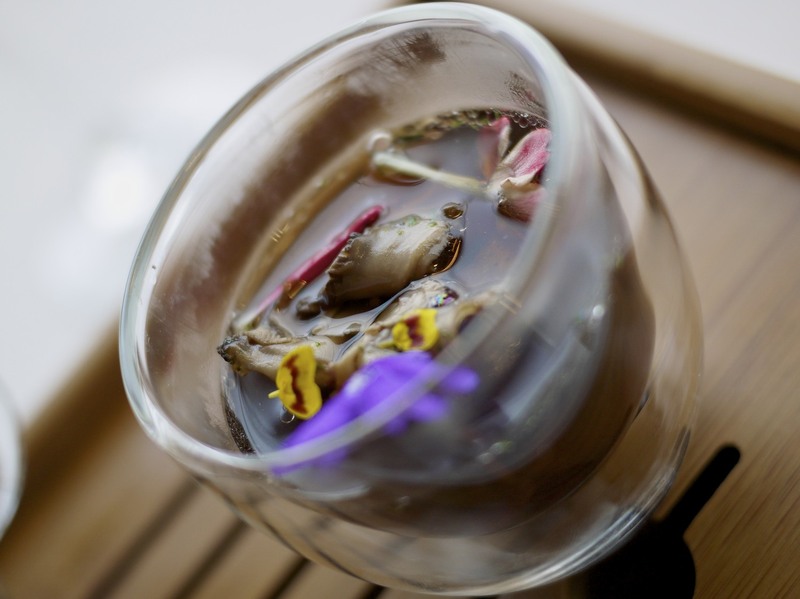 We were instructed to take three tea spoonful of the dried mushroom and add it to the teapot containing a concentrated mushroom consommé to brew. 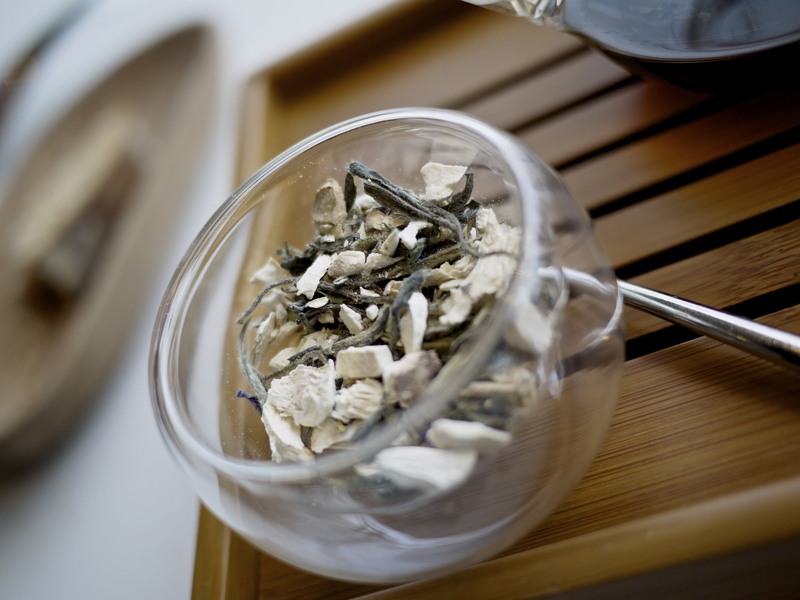 We then left the mushroom tea to brew for a couple of minutes before proceeding to pour it into the cup on the right. The flavour of the broth was just outstanding considering this was just made from the humble champignon mushroom. The meaty mushroom had bags of flavour and the overall flavour lasted a very long time. 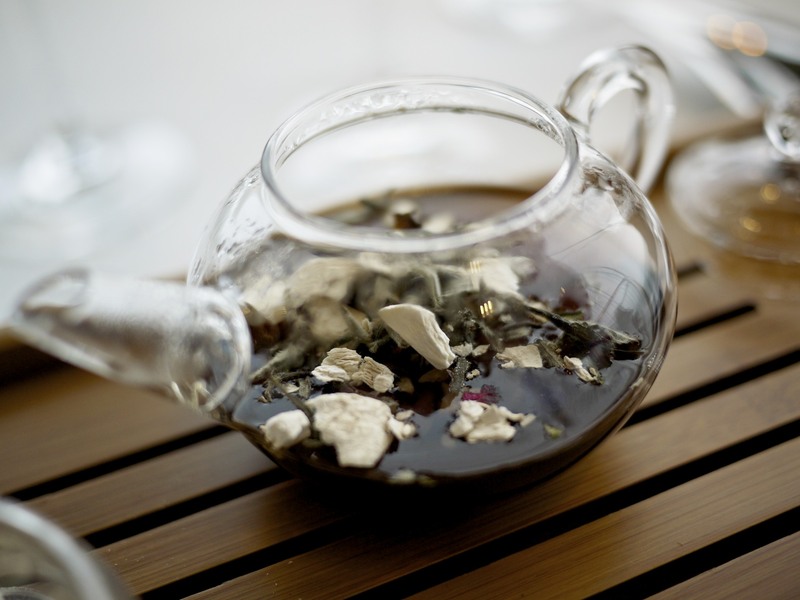 I was so impressed I went to add a few more spoons of dried mushroom into my teapot to increase the concentration. I was in fungi heaven and this was probably one of my three most favourite mushroom courses I’ve ever had next to the Mai-take brioche in De Librije and the woodland mushroom and quinoa dish at Mirazur. Next up was Smoked Foie Gras Sandwich with Tapenade, a new dish which had not been served yet to other customers. 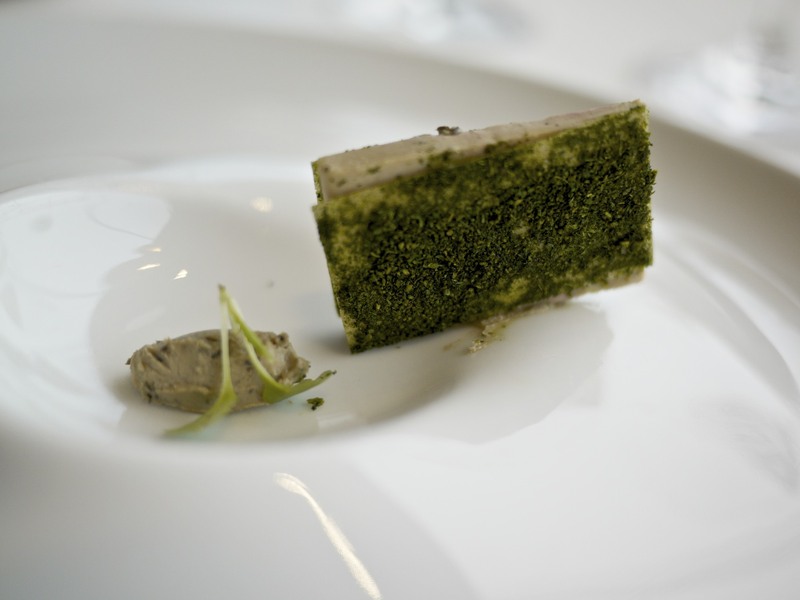 The foie gras encased in a herby cracker was so delicately poised on the plate it fell on its side a couple of times before it was presented perfectly on the third time. I didn’t really mind but our Maitre D was a perfectionist and I appreciated the attention to detail. We were advised to eat the sandwich with our fingers. The smokey foie gras was nice with the contrasting crunchy cracker. The tapenade on the side, which contained a leaf of sunflower, was nice but I thought the dish could have done with a bit more acidity to cut through the rich foie. I absolutely love sweetbreads and I think it’s such a shame that many restaurants are too afraid to use them so I was in for a treat with the next course of Cauliflower, garlic potato and sweetbreads. The potato soufflé was stuffed with a garlic cream inside that oozed out. The cauliflower was served golden and crispy on top. The lamb sweetbread, which we were told was the traditional choice in the region, was beautiful without a strong offal flavour. The components were all assembled on a bed of cauliflower purée. One of the two best courses of the day, hands down, without a shadow of a doubt was the “Betizu” ox tail raviolis, wrapped in corn bread with legume broth. The ox tail had been stewed on the bone for hours and the soft meat then taken off the bone. Iberico ham was then mixed into the meat before being wrapped in a thin layer of corn bread like a sushi roll. The rolls were then fried on each side to give the perfect crispiness to the bread coating. The finishing touch was to add this delicious morsel on a bed of sticky vegetable sauce containing chickpeas and basil. Each bite released an explosion of flavours. Whilst based on the taste, I normally would have begged for more, in fact this was exactly the right portion because it was such a rich dish. We were surprised to find another rich dish for the next course. We were assured that this was a good progression of flavour and he was right again with the Salted stew: vegetables, anchovies and iberics with “Idiazabal” cream cheese balls. The stew was made of shallots, green asparagus, anchovies, trotters and bacon giving it a hearty and punchy flavour – a real smack in the mouth. The Idiazabal cheese had a strong flavour on its own but worked well in the context of the dish and you could appreciate the flavour of the local cheese. I was glad to see that Atxa had incorporated another great dish from the region into his menu, and who wouldn’t? Kokotxas, pil-pil and tender and crunchy artichokes. On this occasion the dish was prepared by using kokotxas from hake in olive oil and a very creamy pil-pil sauce with chilli. 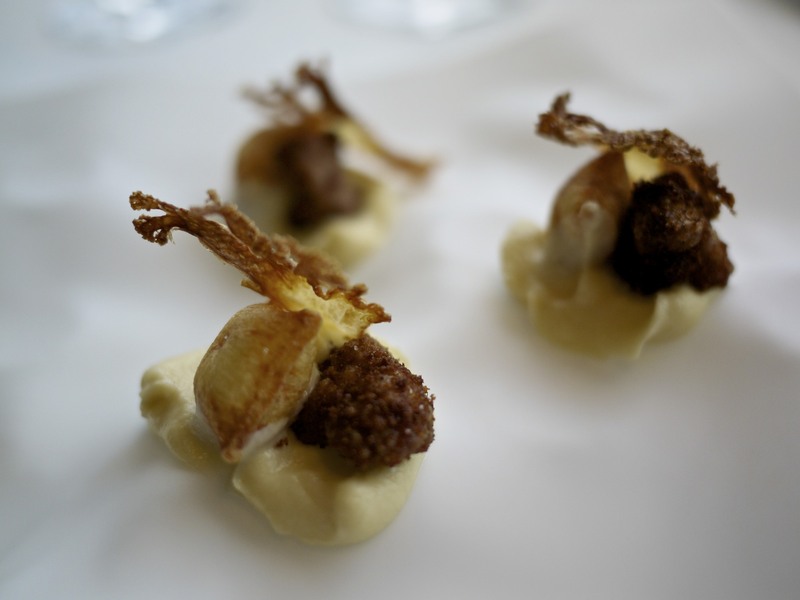 The confit artichoke was fried and cut finely to spread the crunchy texture across the dish. Another good dish! The second best course of the day following the oxtail dish was the Pigeon, hazelnuts and deuxelles. This was possibly the best pigeon dish I’ve ever had to date. The pigeon was from Arraiz, Navarra. 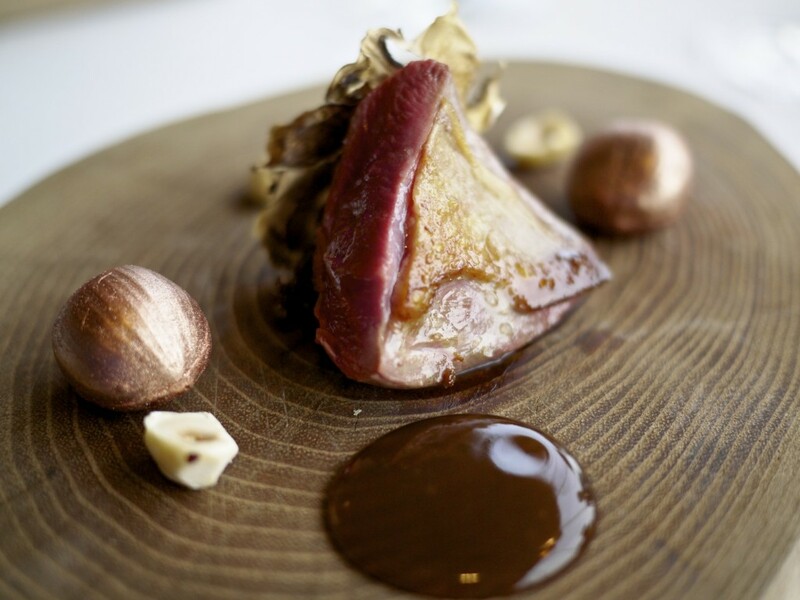 There were some natural hazelnuts as well as “artificial ones” which were made from a mixture of the foie gras of pigeon and reduced stock from the bone, served chilled. The sauce was made from cheese and mushroom. The pigeon was cooked perfectly pink with good seasoning and the mushroom added a lovely earthiness to the dish. The nutty flavour and crunchiness of the hazelnut was the perfect accompaniment to the pigeon. Great use of textures, flavours and temperatures. 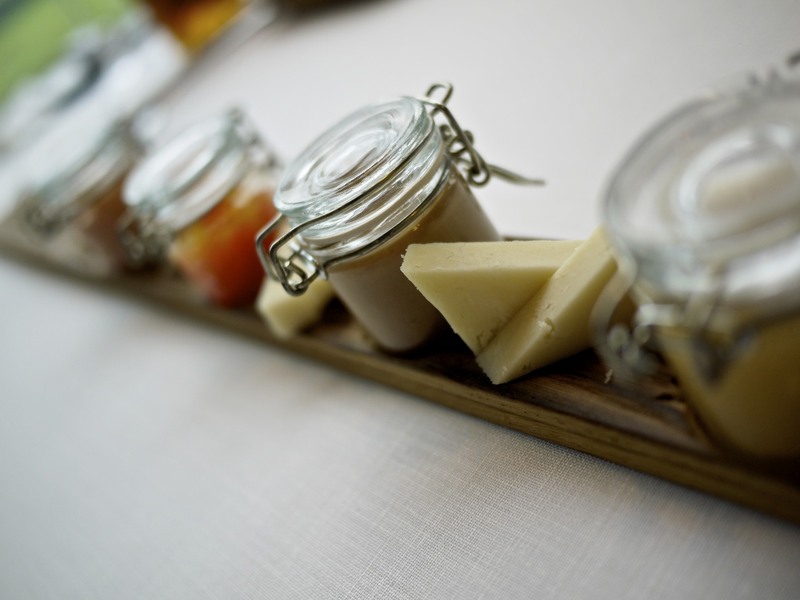 I’d never say no to trying some local cheese of course! 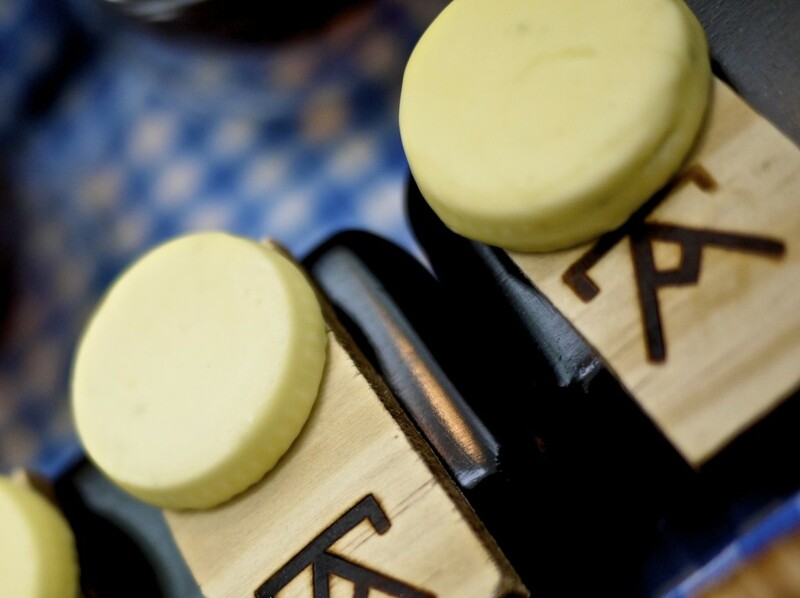 We were presented with a traditional long wooden palate containing two types of Idiazabal – one half cured and one smoked, some Carranzana, which was made from an ancient Basque sheep breed, and a blue cheese from Artziniega. They were all matched with marmalade made from apple, prune, quince and a most peculiar but delicious carrot. … which contained Chestnuts with vine shoot scent. 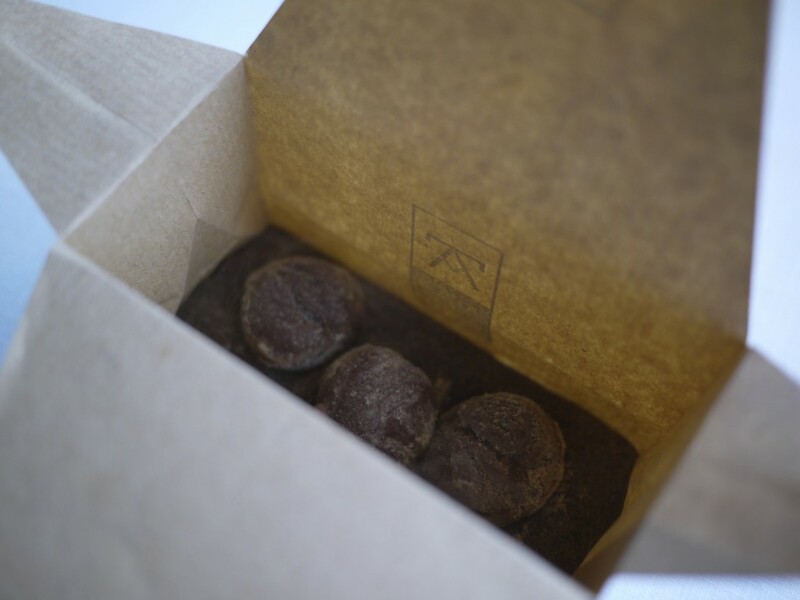 As we opened the bag, a waft of smoke came out carrying a lovely smoky smell of roasted chestnut. This took me back to my childhood in Asia. What was unexpected however, was that the chestnuts inside were neither hot nor indeed actual chestnuts. 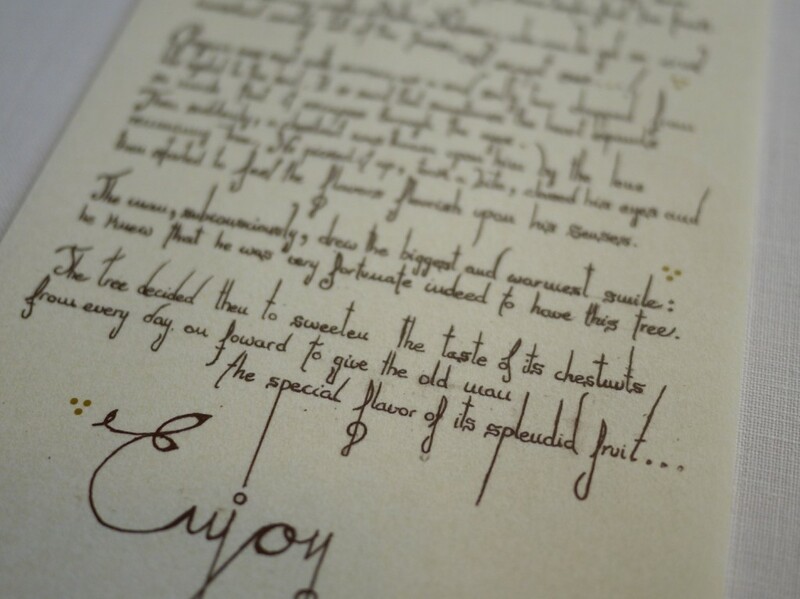 Instead they were chilled chestnut purée’s made from double cream with chocolate milk and natural chestnut powder, resting on a bed of chestnut powder made again from chestnuts that had been roasted until they were burnt before being ground. 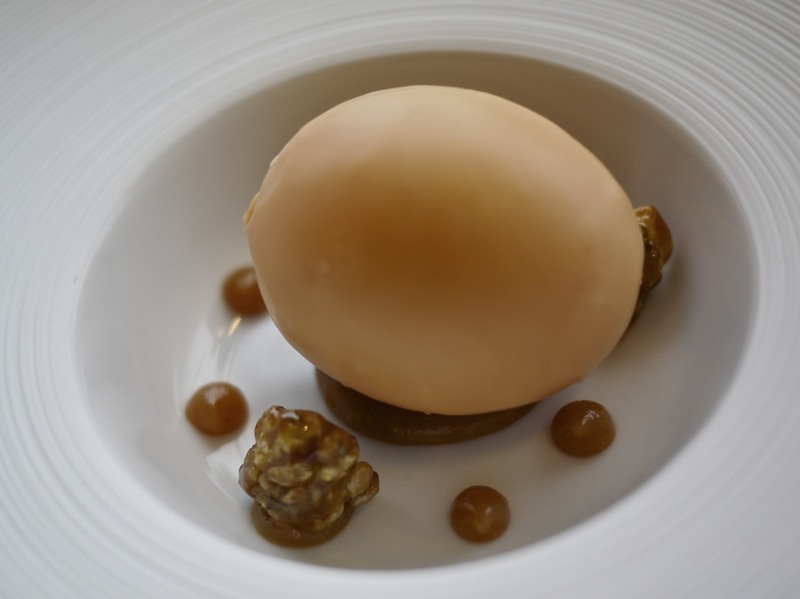 The first dessert of the evening was Coffee Pudding, Rum and Farmhouse Milk, which appeared like a giant egg decorated with caramelised hazelnuts. As we cracked open the outer shell there was a coffee purée inside that had a hint of rum. I usually prefer to not have alcohol in my dessert but this was perfect in dose as you could just pick up the flavour. The caramelised hazelnuts added some texture and the little specks of dulce de leche added that sweetness the dish needed. I love coffee so this was right up my alley. Up next was Honey. I had seen this dish on various websites prior to coming to the restaurant and had hoped to try it. 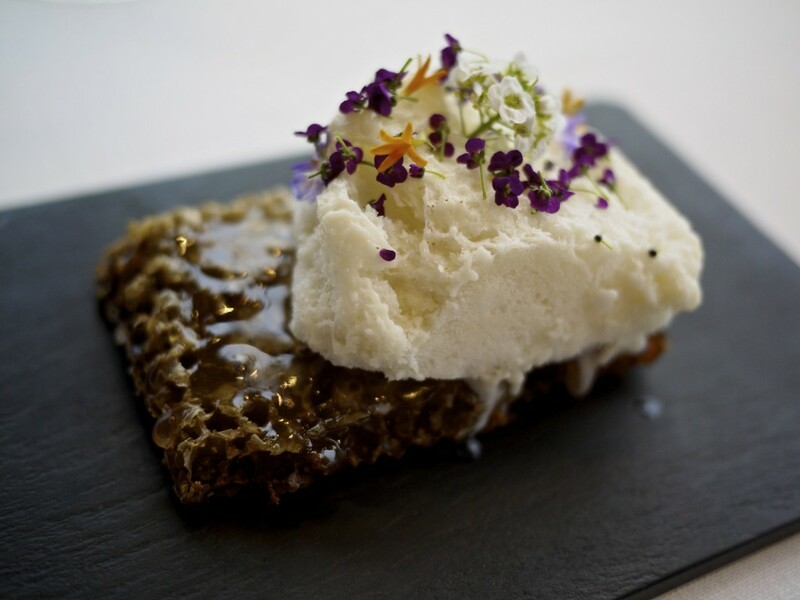 It is Atxa’s signature dish of honey comb with frozen air of honey with thousand flowers. His inspiration came from a chiffon cake. 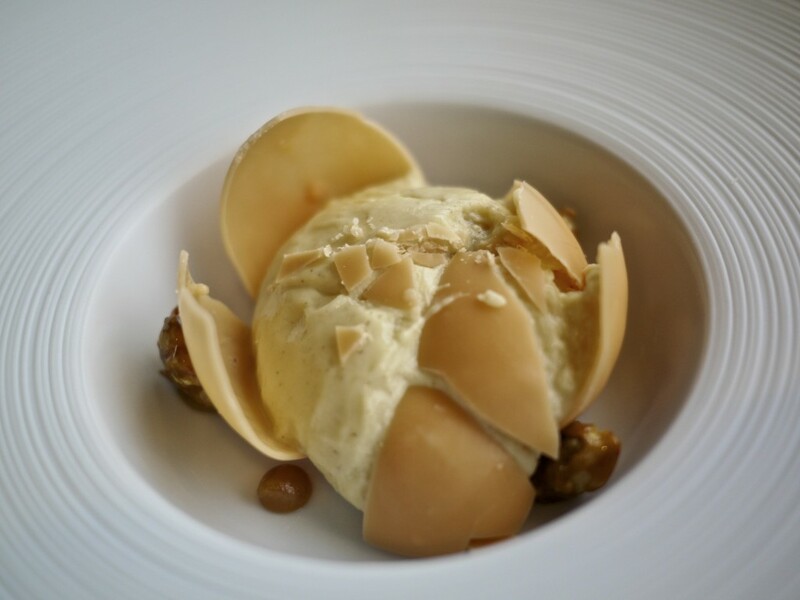 He wanted to create a light and airy dessert but with a much more intense flavour. This was achieved by whisking honey, glucose and sugar together before adding it to a vacuum bag. It was then cooked before adding air back into the bag, finally freezing it after it expanded. A pinch of the honey scented sweet alyssum was added as a beautiful garnish on the frozen honey. This was all beautiful presented on a slab of honey comb with more honey drizzled on it! If you love honey, this is one dish you really don’t want to miss and definitely a feast for the eyes. To go with our coffees we had an array of petit fours starting with a passion fruit chocolate ball on the right, followed by a rice soufflé in the middle and finishing off with an apple pie. With a growing number of young talented chefs like Eneko Atxa, it would seem as if the Basque region’s reputation as a culinary Mecca is safe for a while. 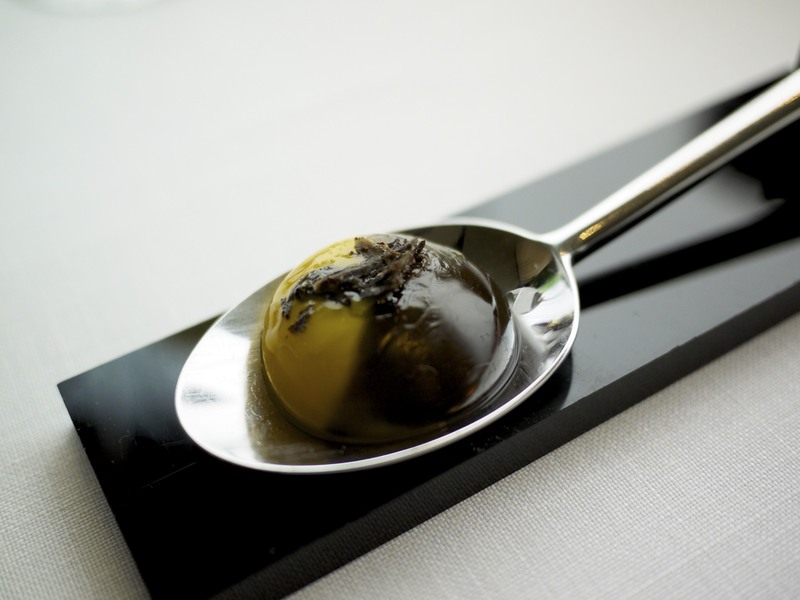 Just like the gastronomical revolution led by legendary chefs from Arzak and Akelare a couple of decades ago, new chefs like Atxa appear to be paving a way for a new refined cuisine that continues to embrace their heritage and roots. The cooking here was without doubt very accomplished. I also loved the luxury of having so much space between the tables, allowing us to take in the whole experience without bothering and being bothered by other diners. Also, if it hasn’t been obvious already, the service here led by Jon Eguskiza was flawless. Top that off with amazing views through floor to ceiling windows across the entire dining room and you’ve got yourself a recipe for success. 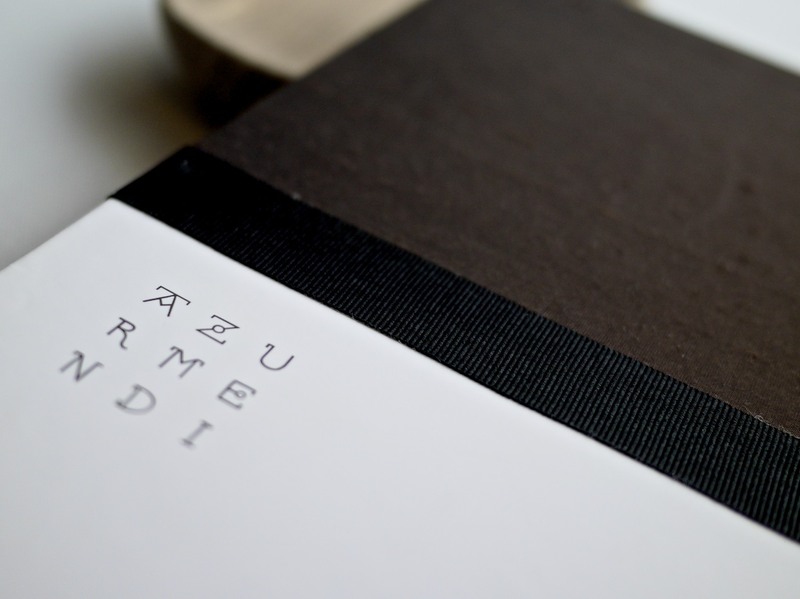 I hope on my next trip I’ll get to see the genius behind everything that is Azurmendi. 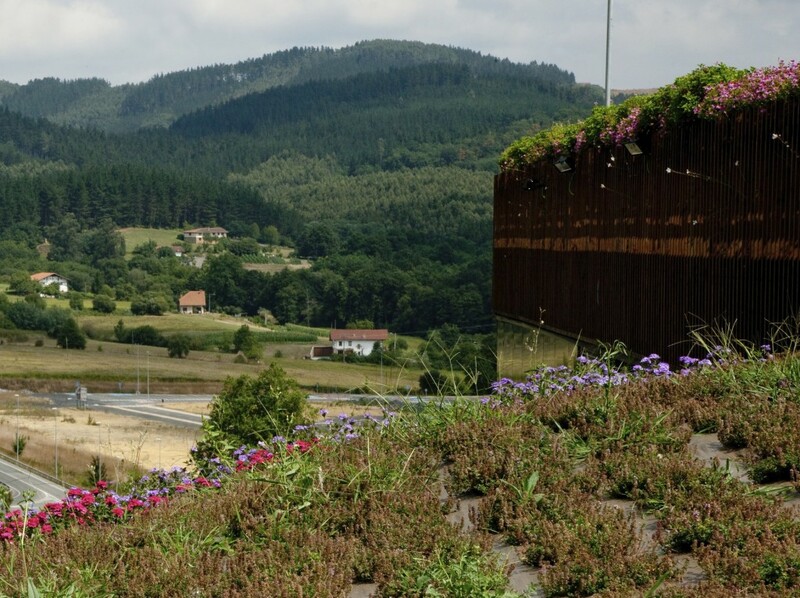 This entry was posted in Spain and tagged Azurmendi, Basque, Eneko Atxa, Jon Eguskiza, Larrabetzu on May 21, 2013 by admin.